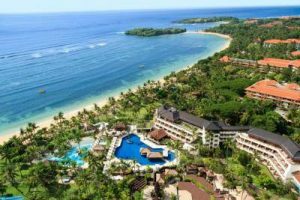 Nusa Dua Hotels Local accommodation details for Nusa Duo Bali Indonesia Comprehensive Listing of the Hotel Accommodation Destinations found in Nusa Dua. Nikko Bali Resort & Spa Situated in Nusa Dua, the luxurious Nikko Bali Resort overlooks the beautiful Indian Ocean and is only five minutes’ ride from a world-class golf course and shopping centre. Spacious rooms at Grand Nikko Bali offer balconies with calming garden or breathtaking ocean views. Flat-screen TVs and tea/coffee makers are provided. Select rooms feature iPod docks and DVD players. The resort organises camel safari rides and provides a jungle camp for children. A gym and tennis courts are available for fitness-conscious guests, while pampering massages are available at the spa. Those wishing to relax can do so at the sun loungers and private cabanas. Italian, Balinese, Japanese and European cuisines are among the dining choices in Grand Nikko Bali. The air-conditioned rooms are each equipped with a private balcony or terrace with views of the gardens. A minibar and coffee/tea maker are provided. The hotel features a tennis court, a fitness centre and a children’s playground. Bicycles and cars are available for rental. A variety of treatments are available at the YHI Spa. Free Wi-Fi is provided with all purchases at the Lobby Bar or restaurants. Lotus Asian Garden serves Asian cuisines. Sateria Beach Restaurant offers pizzas by the beach. Other dining options include Sorrento Mediterranean Restaurant, Sakura Sushi Bar and El Patio Coffee Shop. Nusa Dua Hotels. An international buffet breakfast is served at Wedang Jahe Restaurant. The award-winning Raja’s Restaurant offers Balinese dishes. Other dining options include Italian and Asian outlets, while cocktails are available at any of the 4 bars. Nusa Dua Hotels. Nusa Dua Beach of Bali, Indonesia. Conrad Bali Located in the south of Bali, the beautiful Conrad Bali offers guests a world of luxury with spacious rooms, breathtaking views and excellent facilities catering to both adults and children. Melia Bali Villas & Spa Resort This luxurious resort is conveniently located directly on the beautiful beach of Nusa Dua, Bali’s most exclusive resort area, just a minute from the eating places, modern amenities and amusements.Nusa Dua Beach Hotel & Spa Nestled within 9 hectares of lush tropical landscape gardens, the resort features all the elegance of a Balinese palace, yet offers every modern amenity and convenience for a luxurious getaway. Take A Break Holidays takeabreakholiday, Nusa Dua Hotels Accommodation. San Francisco De Asis, Urb Marina, San Fulgencio, 03177, Alicante, Spain.